Growers 10 lb. Cherry Challenge. I've been eating them like candy - love them! 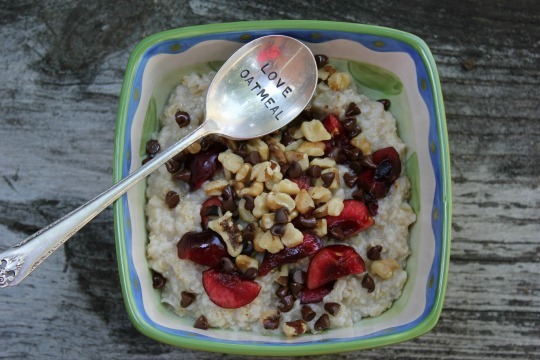 Great mornings begin with oatmeal! In a small sauce pan bring milk to a boil. Stir in oats. Cook about 1 minute over medium heat; stirring occasionally. Pour into a bowl and top with cherries, walnuts, chocolate chips and a dash of almond milk. Keep up to date with Me and My Pink Mixer by following on Facebook, Pinterest, Instagram (meandmypinkmixer) and Twitter. I'm going to try this even though I'm not generally a fan of fruit in oatmeal. But cherry might be enough to trump that. And I totally want that spoon.